Burgul, burghul or bulgur along with many other variation for how to pronounce it is one of the staples of Lebanese food. It is used very much like rice. So, it can be used to make a pilaf, for a stuffing ingredient, in breads, in salads or dips. Before rice was known in the mountains of Lebanon, burghul was used primarily. Now, rice is certainly ubiquitous almost anywhere you go, but burghul still holds a high place in the Lebanese kitchen and is irreplaceable in many classic preparations like Kibbeh, Mujaddara and Balila. To make burghul dried wheat kernels are boiled till tender, then allowed to dry in the sun for several days until bone dry. This practice usually takes place towards the end of summer, right after the wheat is harvested and is without question one of my favorite times of year. My grandmother would reserve the huge pot (called Halla in Arabic) in which to cook sacks of wheat as early as possible since usually there are only a few per town and every family needs to reserve a spot for one. She then would make sure a few able men are available (family, friends and neighbors) to haul the boiled wheat to the roof of her house to dry. The smell of the air at that time of year is intoxicating and is one of those fond memories that will always remain with me. The boiled and now dry wheat kernels are taken to the mill and ground into fine, medium or coarse burghul. The coarse grind has grains as big as short grain rice. The fine grind is more like the size of white sugar granules. The medium is in between. Sometimes very fine burghul is also called Sraisira. 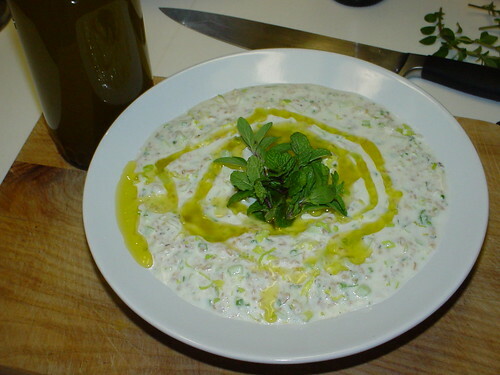 Almost everyone have heard of Lebanese Kibbeh and recipes for it abound. So, I chose to post about another dish that features bulghur. It’s called Balila (meaning something along the lines of ‘wet’). 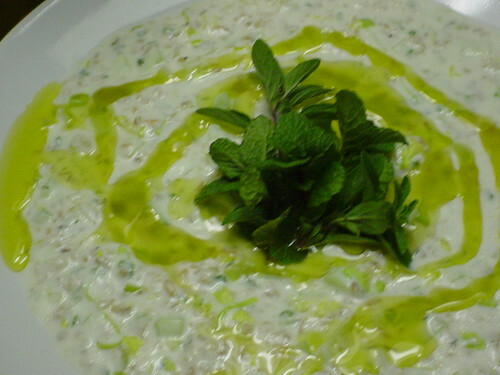 It’s a delicious dip, side dish for grilled lamb or a light lunch meal with pita bread crisps. It’s better if you prepare this the night before and let it sit in the fridge. Serve it cold. Place the burghul in a bowl and cover with cold water. Let is soak for at least an hour until soft and chewy. Peel the cucumber and dice it into 1/8 inch pieces. Alternatively grate it on the coarse side of the cheese grater or Mandolin. Chop the green onions, both white and green portions. Chop the lettuce. Coarsely chop the mint. Drain the burghul and place in a bowl. Add the rest of the ingredients and mix well. Season it with salt and pepper. Cover it with plastic wrap and let it sit in the fridge for a few hours for best results. Taste before serving and add more seasonings or olive oil if you need to. Serve it cold garnished with more mint leaves and generous drizzles of good olive oil. 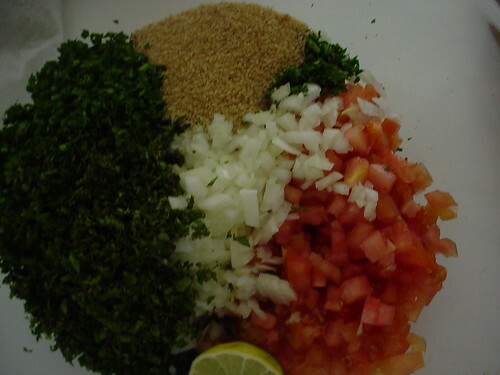 Tabbouli, unlike Balila is quiet common outside of Lebanon. I can even buy a sorry version of Tabbouli at my local Target store! Since we are talking about burghul, here is a proper sample of this salad I made recently. And DON’T let anyone convince you that Tabbouli is still Tabbouli without burghul as some claim. 30 Minutes to an hour before serving, mix all the ingredients and let it sit in the fridge to mix the flavors and for the burghul to soften a bit. Taste and adjust the seasoning, lemon juice and oil quantities. 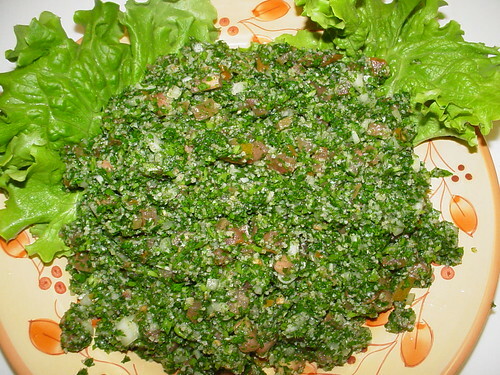 The Tabbouli should be on the lemony-tangy side, with the parsley as the dominant ingredient and the burghul should retain some bite. 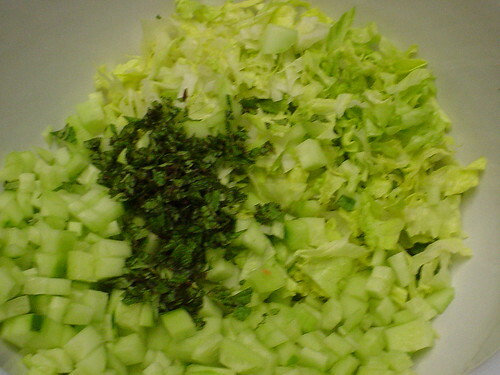 Serve it with some lettuce or cabbage leaves to scoop with, either cold or at room temp.